I’ve been excited about Marlon James’s new book ever since I first heard about it. Other-worldly fantasy drawing from African mythology? Yes, please. But then I started hearing how violent it is, and I wasn’t sure I could stomach it. I can tolerate quite a lot of violence in my fiction, but when it’s too relentless or too gruesome, I lose both my nerve and my interest. So I picked this up with a lot of mixed feelings. The book’s main character, Tracker, begins the book in prison, making what appears to be a confession or testimony to his jailer. And that testimony forms the bulk of the book. 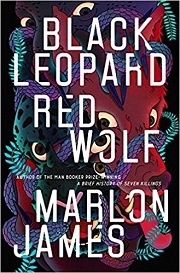 He tells the story of his early life and his connection with the Leopard, a shape-shifter who appears in the form of a man and a leopard. Tracker and the Leopard develop a complex relationship, in which they are sometimes lovers, sometimes colleagues, and sometimes rivals, and that relationship drives a lot of the emotions within the book. The principal plot involves the search for a missing boy, a boy who is more important than Tracker realizes when the search begins. The book has an episodic structure, with each section taking place in a different region, with a shifting cast of characters as different people and creatures join the search. The cast is a mix of lovable misfits and malevolent beings, and sometimes Tracker teams up with his own enemies (or former enemies) if it will get him closer to his goal. The shifting alliances and loyalties made the book a little hard to follow at times, and I sometimes just had to accept plot turns that didn’t make complete sense to me. I was interested enough in the world not to fret too much, especially since I think part of the point was that Tracker lives in a world where you have to get allies where you can, even if it doesn’t make sense. A witch may have her own agenda that runs counter to Tracker’s, but she’s not as vile as, for instance, the white scientists who appear late in the book. Another thing I had trouble following was the dialogue. These characters rarely speak directly, and much of the dialogue is laden with subtext that wasn’t entirely clear to me. 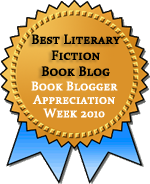 It make the world and the relationships feel bigger than any book could contain, and that is something I appreciated. There are often scenes where characters tell each other stories from their own pasts, all of which adds to the richness. I think this book could reward re-reading in the same way that, say, Dorothy Dunnett’s novels or The Lord of the Rings does. The first read is to get the general shape of the plot. The next read is to understand it. And there are magical scenes that make me want to understand this world more. The land of Dolingo, which felt at first like an echo of Tolkein’s Lothlorien, turns out to have darkness at its core. There are characters like Sadogo the giant and Mossi the prefect who I genuinely loved. And Tracker’s beloved children — I’d love to learn more about them. I understand that the subsequent books in this trilogy will cover the same events from different perspectives, and I’m very curious as to how that will work. The book ends with the suggestion that the next book could come from the moon witch who set Tracker on his task, and I’m very curious as to how she perceived these events — and Tracker himself. This sounds interesting and glad to read a review as this is on my wishlist. I think the violence would put me off a bit too, but it sounds like it could be a rewarding read if I get past that. I certainly found it rewarding enough. It helped to go in with the knowledge that it gets rough. Oh man, I didn’t know that the next book was going to be some of the same events from a different perspective, and that’s so gd tempting. I really am not sure I can manage all the violence though! It sounds really brutal. Blah. I remain very torn. It’s so hard to know when something will cross a line. And for me, sometimes it’s my mood in the moment. I decided not to read the book, after reading about 2 pages of a Kindle sample. Because I live in Africa, the violence & brutality are a page too far; I hear/read too much of it on a daily basis. I can absolutely understand finding it too much. I’ve loved all of James’ books until now and although I can handle quite a lot of violence if it’s well written (Cormac McCarthy) or with purpose (Don Winslow), I’ve had to think about this one. You’ve improved it’s chances though – thank you. I did think the violence here was well-written and purposeful. I read this a while back and your review has just made me realize what the experience reminded me of—a video game! That same sense of the world to explore being possibly more interesting and more the point than the plot itself. Oh, that’s an interesting comparison! The world was really what made this book good, although by the end I was pretty invested in the story, too.